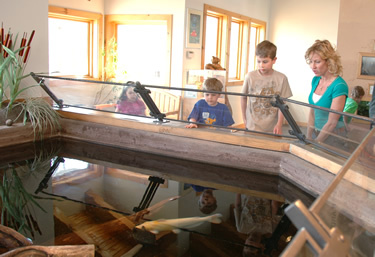 Visit our indoor turtle pond and enjoy seeing some of Monmouth County’s native turtles close up. A pond is a small body of water that is shallow enough, 15 feet or less, to allow aquatic plants to emerge from the water. In our pond, you’ll find native aquatic turtles, such as the painted turtle. Painted turtles can be seen basking on logs in the Reservoir between April and September. 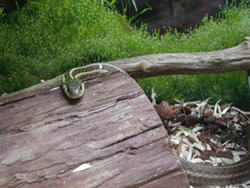 On display in the animal wall are several species of reservoir wildlife including reptiles and amphibians. Some of these animals are aquatic, while others are more terrestrial. You need to look close, but in this display you will find a host of small aquatic animals that form a vital food source for larger aquatic animals like fish and frogs.